Recent and ongoing VA HSR&D-supported research sheds light on situations in which HIE is most effective, and how to overcome barriers to HIE implementation. HIE may improve outcomes of VA medication reconciliation, but blocked access to non-VA pharmacy beneft medication information halts this effect. Real-time provider notifcation of non-VA hospital admission or ED visit, when combined with structured geriatric care coordination, may result in reduced hospital utilization and better quality of care. A large proportion of Veterans utilize both VA and non-VA providers to address their care needs. Non-VA care is common when Veterans have other insurance and when non-VA care is paid for by VA (i.e., “fee basis”). Non-VA care has expanded because of VA Choice, a program designed to increase access for Veterans who have distance and scheduling barriers. Aside from elective use, Veterans in emergency situations may receive non-VA services for problems that require immediate care at the nearest health facility. Because of the division between systems and the increasing complexity of healthcare, accurate and timely communication between healthcare personnel is increasingly important for appropriate decision-making, and it is a key research area for informatics. Electronic health information exchange (HIE) has the potential to beneft Veterans by giving providers the information they need in real time to make appropriate decisions, regardless of whether the providers are VA or non-VA and regardless of where the information originates. Access to accurate cross-system information is especially important for providers taking care of high risk patients (e.g., older Veterans or those with advanced or complex conditions). There are several HIE tools available for VA providers. First, VA’s enterprise-wide HIE tool (formerly Vista Web, now Joint Legacy Viewer) contains encounter information from every VA location and the Department of Defense. Second, VA providers nationwide can communicate with each other through the electronic health record, internal secure email, as well as instant messaging tools. These functions, when considered together as a suite of tools, provide a service well beyond the capability of most private sector organizations. Furthermore, since 2010, VA has partnered with non-VA organizations to provide parallel HIE capabilities that connect VA with non-VA health systems. The Veterans HIE Program (https://www.va.gov/VLER/index. asp), formerly known as the Virtual Lifetime Electronic Record (VLER) Health Program, provides internal and external access to care summaries with information from both VA and non-VA providers. This program includes VA Direct, which enables VA and non-VA organizations to exchange secure messages containing protected health information. A recent systematic review of high quality research studies demonstrated benefts from HIE such as fewer duplicated procedures and imaging, lower costs, and improved patient safety.1 However, knowledge gaps exist regarding situations in which HIE is most effective (including the best information delivery and response methods), which outcomes of HIE are most important to Veterans, and how best to overcome barriers to uptake and implementation. We have conducted VA HSR&D-supported research to help close these knowledge gaps. In a randomized controlled trial at the Bronx VA (IIR 10-146, PI Boockvar), patients admitted to the VA hospital received structured medication reconciliation by a pharmacist with (intervention) or without (control) access to a regional HIE. Patients who received medication reconciliation with non-VA pharmacy insurance data available had more medication discrepancies identifed than those who received usual care (8.0 v. 5.9). In addition, among intervention patients, there were 10 medication discrepancies in 51 patients that would otherwise not have been recognized when pharmacy insurance data were available, and 2 discrepancies in 131 patients when pharmacy insurance data were not available. Our conclusion was that HIE may improve outcomes of VA medication reconciliation but that blocked access to non-VA pharmacy beneft medication information (because of fnancial charges) halts this effect. Because of the high frequency of non-VA inpatient use and the risk of adverse events among older Veterans, improving non-VA to VA hospital transitions among older Veterans is important to achieving improved care across sites. In a new study (IIR 14-049, PI Boockvar, Co-I Dixon), Bronx and Indianapolis researchers are examining the impact of VA provider HIE notifcation when older Veterans utilize non-VA inpatient or emergency department (ED) services, and comparing approaches to responding to this notifcation. Each VA study site has a relationship with a well-functioning regional HIE network that can provide real-time notifcation of non-VA encounters. 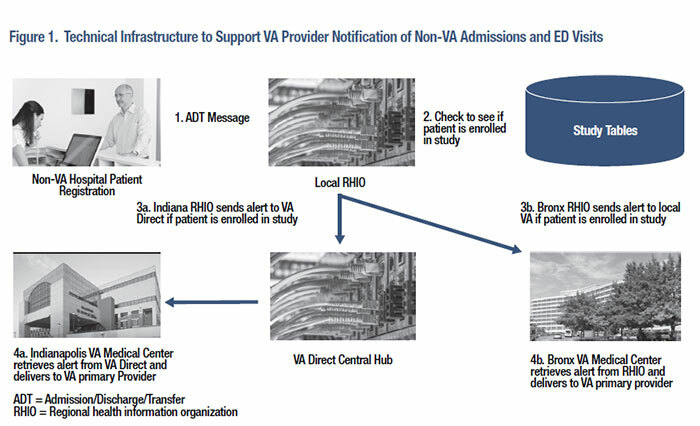 The study will provide real-time VA provider notifcation of non-VA hospital admission or ED visit (Figure 1) followed by post-hospital geriatrics care coordination for older Veterans, as compared to groups receiving usual care and notifcation alone (without geriatrics care coordination). As of August 2018, we have enrolled 551 patients who have experienced 167 eligible non-VA encounters. We hypothesize that notifcation and structured geriatric care coordination will result in reduced hospital utilization (primary outcome) and better quality of care compared to notifcation alone. We are also conducting semi-structured interviews with Veterans, VA providers, and non-VA providers. Findings will identify opportunities for improvement and inform future implementation. In summary, dual system care exposes Veterans to the risk of adverse events due to the lack of communication between providers, and inpatient-to-outpatient transitions are particularly risky for older Veterans. If HIE notifcation followed by a structured geriatric care coordination intervention is shown to be effective, it could be integrated into services provided by PACT teams, Home Based Primary Care (HBPC), and/or telehealth and care coordination programs. HIE between VA and non-VA healthcare providers has gained salience as a result of the Veterans Choice Act of 2014 and MISSION Act of 2018, which have expanded Veterans’ access to non-VA care. VA providers, including primary care providers, specialists, hospitalists, care coordinators, and nurses will see the direct relevance of this research to their practice. Providers and health systems outside of VA may apply our research fndings to development and refnement of their care delivery models. Menachemi N, Rahurkar S, Harle CA, Vest JR. “The Bene­fts of Health Information Exchange: An Updated System­atic Review,” Journal of the American Medical Informatics Association September 1, 2018;25(9):1259-65. Boockvar KS, Ho W, Pruskowski J, et al. “Effect of Health Information Exchange on Recognition of Medication Discrepancies is Interrupted When Data Charges are Intro­duced: Results of a Cluster-randomized Controlled Trial,” Journal of the American Medical Informatics Association 2017; 24(6):1095-101. Dixon BE, Ofner S, Perkins SM, et al. “Which Veterans Enroll in a VA Health Information Exchange Program?” Journal of the American Medical Informatics Association 2017; 24(1):96-105.